On August 14th rather than a regular club night we’ll be using the Town Crier to plan the teams for next season. Please let your captain(s) know any changed circumstances for next season before this meeting. 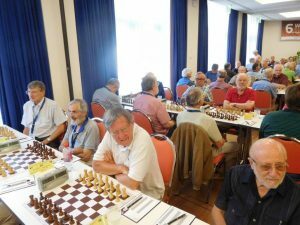 Keith Emerton recently returned from playing in the World Senior Team Championship in Germany. 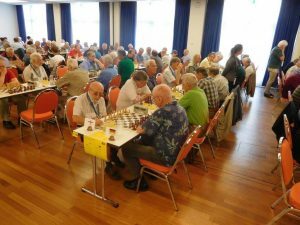 He was selected to play for England 4 in the Over 65 group. Despite being out-rated in many of his games he nevertheless scored an impressive 50% including three wins! As has been noted in a prior news post this year was the 10th Anniversary of the D&A Challenge Cup. David Hulme has shared some of his meticulous records of the event with me (Mike) which sustain sufficient interest upon further scrutiny. Somewhat surprisingly despite being down 5-4 in the series Chester actually lead the series on board count. Of the 217 games played Chester are 3 up leading 110-107. 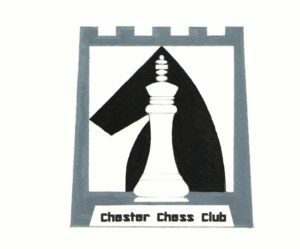 Chester have used 79 different players, Wallasey 52 players, a total of 131 players. Chester having used substantively more players indicative of a strong Junior presence over the series. Both teams possess only two players that have played in all 10 matches: David Hulme and Ian Clayton for Chester; Leon Wolszczak and Colin Rees for Wallasey. All four players deserve congratulations for their commitment to the match series and for Colin further applause is due for his attainment of the best overall score attained by any player (8/10). The best score for Chester being attained by Graham Bromley (7.5/9) who has only missed a single match in 2013. 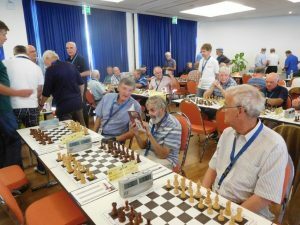 I recently had the pleasure of meeting Markus Haag (president, right) and Andreas Kuglstatter (tournament organiser, left) from the Brombach chess club in Lörrach in Germany. Lörrach is Chester’s twin town and is situated in the bottom left hand corner of Germany very close to Basel. 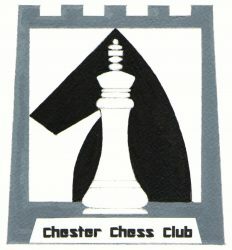 Their club is of a similar size to Chester’s and also has a significant junior component. 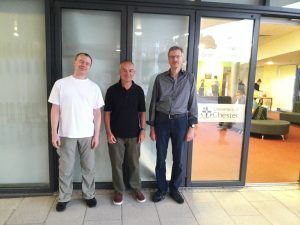 They were visiting Chester assisting a youth exchange programme and are pictured here outside their university accommodation. We discussed exchanging details of the tournaments we each run and maybe playing a match in future. If you might in principle be interested in travelling to Germany to play a weekend tournament and/ or a match then please let me (Phil) know. The votes are counted and logo C won with 11 votes against 9 for logo A and just 3 for logo B. Thanks to everyone for taking the time to vote and for leaving comments. And thanks to Graham for the original artworks!